Sikora AG has recently introduced the new WIRE-TEMP 6000, a system for precise online measurement and control of the wire temperature. At the cable production, it is often required to preheat the conductor prior to the extrusion process. One of the reasons is to ensure optimum adhesion of the insulation on the wire. On the other hand, especially at the insulation of the wires for high-frequency and data transmission, it is important to stabilize and to control the foaming of the insulation. WIRE-TEMP 6000 is part of the PREHEATER 6000 TC, now available as an independent measuring device. It measures the temperature of metallic as well as the surface temperature of insulated conductors continuously on a non-contact base. Designed for diameters from 0.1-10mm (WIRE-TEMP 6010), alternatively from 0.15-100mm (WIRE-TEMP 6100), the system is laid-out for product temperatures up to 150°C, optionally up to 200°C. The measurement of the temperature is independent of the cross section, the material and the structure of the conductor surface. 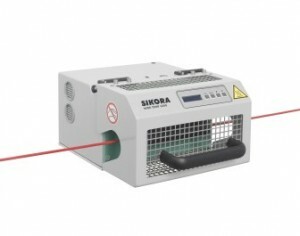 According to Sikora, a big advantage of WIRE-TEMP 6000 over conventional systems is that the temperature measurement is made by means of a non-contact thermal image sensor in an infrared camera, which detects the conductor reliably and provides accurate measurements with no need for calibration. Various communication interfaces are available for the transmission of the measuring values to a Sikora processor system, the line control or a laptop, including module for connections to RS485, RS232, Profibus-DP or industrial field busses such as CANopen, Ethernet/IP, DeviceNet, Profinet IO. The interface module and all connection plugs are fully sealed for protection against water, dirt and mechanical damage.